Nice place, great view, amazing food. Basic facilities (beds, showers) but clean and fine for me. Enjoyed the view everyday we stayed there, can't get enough of it. The food is great and staff is really helpful. 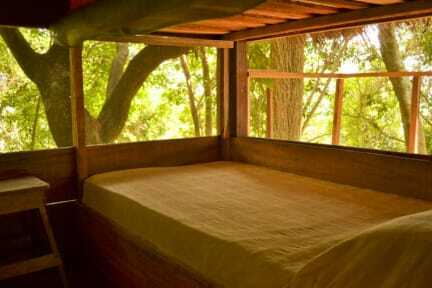 Wow, when I arrived at my own little treehut I was in love! Try to book your own 1person hut, it’s really special. The hostel itself serves really nice food each night (the cakes as dessert are a real bonus)! It has a really cosy, social vibe so I can highly recommend this place! Furthermore, it is close to Minca which is an advantage over other hostels that are more remote. OMG, Casa Loma is gorgeous. Even though we didn't get to see a sunset (we didn't realise the heavy rainy season runs from Sept-Nov), we got to enjoy beautiful views over the mountains from the hostel and our bed :) We stayed in the Casa Selva hut and this was highly enjoyable. Another plus is the food, THE BEST we had in all of Colombia. The book with information available at reception is very handy, plan your activities in the morning in rainy season. A shame we couldn't stay longer! Loved this place. Beautiful setting and views, good food and very nice atmosphere. The view was great and you should definitely watch the sunset here. The dinner at night is very good as well as the atmosphere in the hostel. I would recommend staying the 7-bed dorm, which provides you with a locker and mosquito net. The yoga in the morning was also great! Great social hostel up in the hills of Minca but close to Minca town!! The view and kitchen is amazing! I hurt my ancle really bad and was stuck in the hostel for 3 days but that was no punishment with the great food there. Staff was really helpful since I couldn’t do much. Thanks again!!! Would def go back next time! Flinke klim naar boven voor je het hostel bereikt, wat wel mooi gelegen is. Ik had een prive hutje, waar eigenlijk alleen een bed in stond, maar zeker aan te raden is zo midden in de jungle! WC was wel wat verder weg (zeker s nachts in de jungle vond ik dat minder) en een koude douche. Vond het personeel ook wat warrig. Avondeten wordt aan iedereen tegelijk geserveerd, wat ik leuk vond voor de sfeer. GEEN WIFI beschikbaar.